OFF GRAVESEND. The cutter River Thames for river pilots. 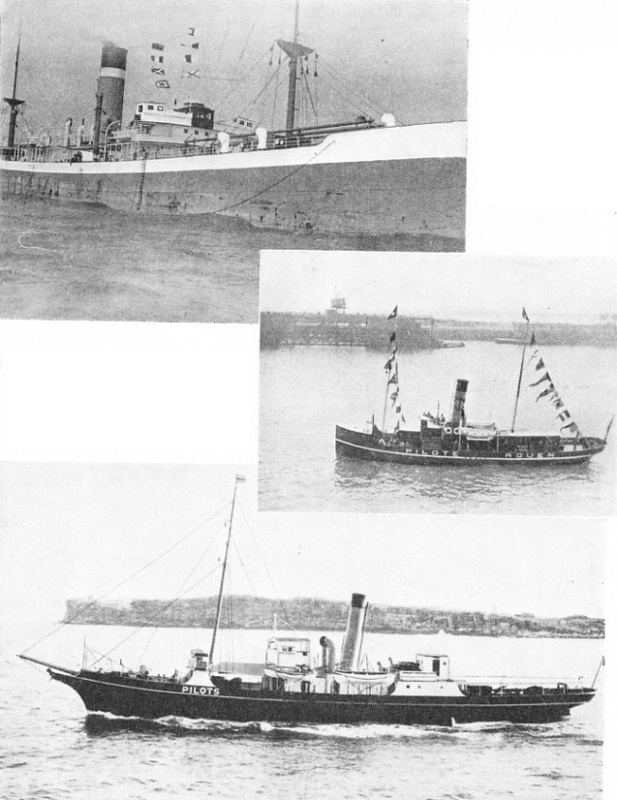 Ships proceeding to London generally take a pilot on board at Dungeness or near the Sunk Lightship off Harwich. At Gravesend the sea pilot lands, and here another pilot, with a special knowledge of the river, takes charge. IT is a compliment to the vividness of Captain Marryat as a novelist, but a poor one to the modern pilot, that the description Marryat gave in “Poor Jack” is the one that often comes to the mind of the layman when he hears a pilot mentioned. Marryat’s picture of the bluff old longshoreman of the Downs, with his shrewd common sense, knowledge of the sea and innumerable waistcoats and mufflers, was true enough in the early days of the nineteenth century, and with the ships of that day he did his work well enough. But by now this description ought to be replaced by the terse and graphic words of Joseph Conrad: “He resembled a pilot, which to a seaman is trustworthiness personified.” And for the externals, it is necessary to look to the master of a first-class liner. authorities are content with a second mate’s certificate. Others, again, draw their pilots from men who have served their apprenticeship in the cutters. Such men are second to none in the handling of small boats, but often have to acquire their knowledge of big ships by experimenting with other people’s property, although they generally become expert in a short time. With so much variation in the qualifications required, it is difficult to draw a composite portrait of the British pilot, and to make it include those of the Dominions, colonies and foreign countries. But by taking a first-class district such as London, which is directly under the control of Trinity House, the senior pilotage authority, it is possible to obtain a picture which can be modified according to circumstances. The Pilotage Committee of Trinity House, the authority for the London district, has the great advantage of being governed by practical seamen of the highest standard, the Elder Brethren. Some authorities, however, are subject to local bodies, being appointed by the Corporation; others are more independent, but consist largely of merchants and other business men who are connected with shipping but who have no technical knowledge of its difficulties. In other districts, again, there is no compulsory pilotage at all, so that it is only the careful owner who looks for help from a man with local knowledge. The London district is a compulsory area. Its limits are laid down by Act of Parliament, and within those limits all ships must take a pilot unless they are specially exempted. These exemptions cover regular traders, provided they are not carrying passengers, whose masters; may be presumed to have learned the district thoroughly, and also a number of vessels, generally carrying at least a certain number of passengers, whose masters and mates have appeared before Trinity House, and who have sat for an examination which has proved their knowledge of London waters. This examination is not as difficult as that which has to be passed by the ordinary Trinity House Pilot, but it demands a tolerable knowledge. If any ship which is not exempt attempts to slip through without going to the expense of taking a pilot, passing the cutter without flying a signal, pretending that she has a pilot on board already, or not giving the pilot the chance to board, she may find that the penalty is a heavy one. 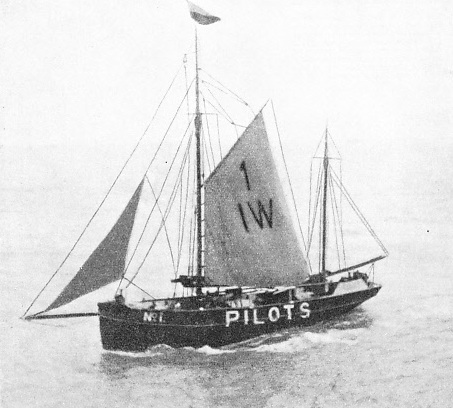 ISLE OF WIGHT PILOT CUTTER No. 1. Apart from the pilotage districts which come directly under the jurisdiction of Trinity House, there are over 120 pilotage districts in the British Isles. Conditions of service, fees received, and duties vary with the district. Not all countries take the pilot’s position so seriously as does Great Britain. This is generally the reason for a foreign captain trying to slip through. When the pilots of his own country are longshoremen with little real knowledge, he is apt to think that he can do just as well himself and that the engagement is an unnecessary expense. But even in the less exacting of British pilotage districts the applicants for a licence have to go through a thorough examination and must be fully qualified. The Act of Parliament says that the pilot shall “take charge of the ship”, but there is a good deal of doubt as to just what that covers, for in general law the master is always in charge of his own ship, and is the final authority. In many ways that is as it should be, and the advisory capacity of a pilot is satisfactory enough, it it is regarded properly. A comparison may be made with the medical profession. The family doctor cannot be expected to act as specialist, and the specialist has to be paid for his particular knowledge. The general practitioner who disregards the specialist’s advice and loses his patient’s life is in the same position as the captain who knows better than the pilot and wrecks his ship in consequence. The captain must face an inquiry by the Board of Trade if he has a really serious accident, especially if it involves loss of life; but the pilot has to appear before the Elder Brethren of Trinity House for trivial mishaps, and if he is in error to the slightest degree he is suspended (euphemistically “given a holiday”) for a period, during which his income stops completely. Thus the pilot has a great deal at stake, in addition to the responsibilities of a master mariner of unblemished record and reputation. For London and certain other districts, which formerly admitted many watermen into the service for their local knowledge only, a master’s certificate is a first qualification for entry, and there are other qualifications as well. Before he can be called for London service, for instance, the master mariner must have spent a period in charge of the watch of a square-rigged ship. As there are no British square-riggers left on the high seas, this is a matter of great difficulty. A barquentine is allowed to count, and any number of embryo pilots serve a spell on the coast as mate of the Waterwitch, the last qualifying square-rigger under the British flag. Others have to seek their experience in the ships of other countries, some of whose owners naturally seize the opportunity of obtaining a first-class officer for no pay, or even for a heavy premium, because they know that he cannot gain his experience anywhere else. Another qualification is that the sea or Channel pilot, bringing ships into the Port of London from Dungeness in the south or from the Sunk Lightship off Harwich in the north, or taking them out to sea from Gravesend, must have been an officer of a coasting vessel of more than a certain tonnage, trading regularly with the port through both the North and South Channels. To obtain that experience he must resign from the liner company in which he is serving, often well on the way to command, and find a job in this capacity. When large numbers of ships are laid up, and there are more certificated officers than berths available, that is not always an easy task. 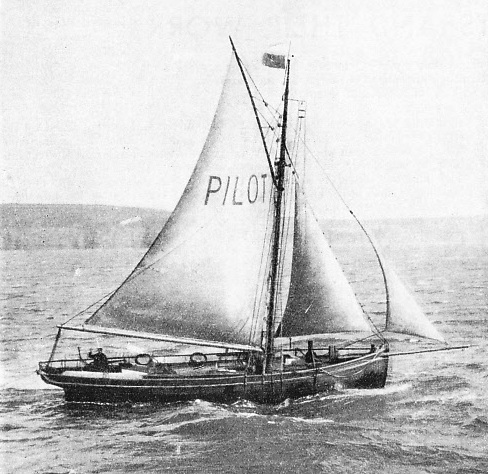 THE WATERFORD PILOT CUTTER off Dunmore, on the east coast of Ireland. The pilot’s cutter may be steam-driven, motor-driven or a sailing vessel, according to his district. Having surrendered all his prospects of the command of a big liner, in addition to dipping heavily into his own pocket to keep himself going, the applicant watches his name slowly creep to the head of the waiting list as vacancies occur. The process is slow, as the number of pilots licensed is strictly limited and is seldom increased. It is an anxious time; unless he has received his licence before his thirty-fifth birthday, his name is automatically struck off the list, and he has made all his sacrifices for nothing. If he is within the age-limit when he reaches the top of the list, he still has to pass a searching medical examination and a still stiffer examination on his technical knowledge. These are followed by other examinations every January. If he fails, medically or otherwise, he is out of the service, with little or no pension. Moreover, he is always liable to have his licence cancelled for misbehaviour or incompetence. So it must be admitted that the pilot, apart from the fact that he conducts hundreds of millions of pounds’ worth of property through the most difficult channels, runs a big risk before he can feel at all sure of the large income which he is popularly supposed to draw. There is a good deal to be said about this popular impression of the pilot’s earnings. To begin with, he is entirely on piece work, and is paid only for the jobs that he does, according to an accepted scale laid down by Parliament. Secondly, the figures accepted by the layman are often misleading; for they are the maximum and not the average. The choice pilot of a big company, that is to say, the man who is always selected to conduct that line’s ships, can earn big money. But on every station there are others who are not so lucky in having their work prepared for them in that way and who have to take their turn with whatever ship comes along, big or small. Finally - and the most important point of all - the published figures are always the gross earnings and take no notice of expenses. These are always heavy, although they vary according to the station. In most instances, travelling expenses have to be taken into consideration. The pilot has to return at his own expense to his station as soon as a job is completed. Travelling and hotel expenses can be extremely heavy. On many stations the pilots have to buy the cutters from which they are shipped and to pay for their maintenance. On others they have to pay the rent of headquarters. In London, for instance, the pilots have to find the rent for the rooms in Trinity House, from which they are controlled. Expenses vary according to circumstances and station, but they are always heavy and can easily amount to twenty-five per cent of the attractive figures which are published. E ven so, the pilot cannot hope to earn a big income from the start. At first he is entrusted only with the smaller ships, some stations having three grades and some two. On all the sections of the London station there are two grades, under and over 14 feet draught of water. For his first three years the pilot, master mariner though he be and fully qualified in every way, must not handle a ship drawing more than 14 feet, except in an emergency when there are no “all draught” men available. The difference that this makes to a pilot’s income may be understood when it is explained that the fee he draws for each job is based almost entirely on the ship’s draught of water. There is an allowance for tonnage, for the authorities have been finally made to realize that a big ship “bung light” and drawing little water is generally much more difficult to handle than a deeply laden ship steering properly. The pilot of the deeply laden ship has only to reckon on steering within the channel which he knows contains sufficient water, but the man who has a light ship has to reckon on her being blown right out of the channel by the wind and becoming unmanageable. THE ELBE PILOT boarding a steamer off the German coast. When the pilot arrives he shares the responsibility of the ship’s safety with the captain, acting in an advisory capacity rather than having complete control of the vessel concerned. When, with three years’ experience of ships of 14 feet draught and under, he has satisfied the authorities that he is capable of handling a ship well and doing his job in a thoroughly trustworthy manner, the pilot sits for another examination. If he is successful, he gets his “all-draught” licence; this permits him to handle vessels of any size. Whether he then looks out for the post of first, second or third choice pilot for one of the big companies, or whether he prefers to take his turn in the cutter or station, depends on circumstances. But is it undoubtedly the position of first choice, always filled by an experienced man of fine qualification and reputation, that brings in the big income. All the time, as has already been stated, the pilot has the risk of losing his livelihood through a minor accident which would probably incur no punishment and do nothing to jeopardize his career if he were an ordinary ship’s captain. This strict rule may appear to work harshly on occasion, but the authorities take the view that the shipping companies must have absolute confidence in the pilots, or it is useless to maintain them. The best and most far-seeing authorities set, and by their strict discipline maintain, the highest possible standard. Generally speaking, the shipping and marine insurance worlds are grateful to them for doing so, especially in a port with such difficult approaches as London. It is always a matter of remark that in the London station - to take again the one with the highest standards - the pilot who brings a ship into the river must not take one out again, but must go to the expense of returning to his station by train. Similarly, the Channel pilot who conducts a ship out from Gravesend has to return and wait for his next outward turn. 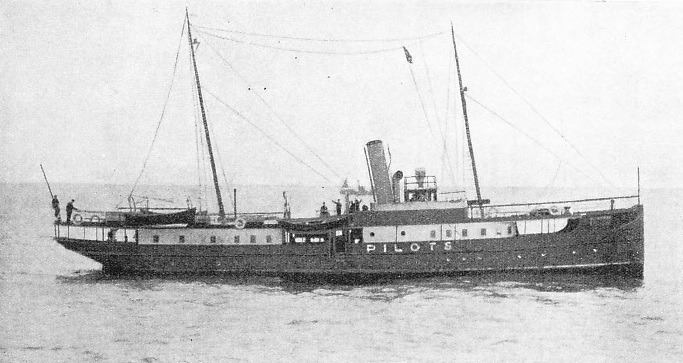 It seems illogical to put the pilot to this trouble and expense when his services nearly always end at the Sunk Lightship for ships going through the Northern Channels, and off Dover or Dungeness for ships going through the Southern Channels, close to a cutter which is cruising with pilots to go into the ships bound for London. Ships coming in from the Sunk, indeed, often bring anything up to half a dozen Gravesend Channel pilots in as passengers, but they have to be in charge of the pilots on the Harwich Station who have boarded them from the cutter. In the old days there were what were known as “in and out” licences, with which a pilot could be paid for his work in either direction. But the arrangement was found to be disadvantageous and was changed. For the pilot anxious to earn good money was apt to over-estimate his physical powers and to collapse under the strain. Further - a factor which counted much more in the days when the ships were dependent on the wind - a long spell of wind favourable to ships entering the port would hold up the vessels leaving it, so that there was a risk of all the pilots being collected at one end, while ships arriving at the station could not receive attention. Practically the only exception is when the supply of pilots fails, almost invariably because of fog. Then the Ruler of Pilots at Gravesend, or the Superintendent of Pilots at Harwich and Dover, has the right to order the men of other stations to undertake the work, so that there is no delay in shipping. It is one of the proudest traditions of the pilotage service that shipping is seldom delayed for lack of attention, fog being almost the only cause - a cause beyond any man’s control. 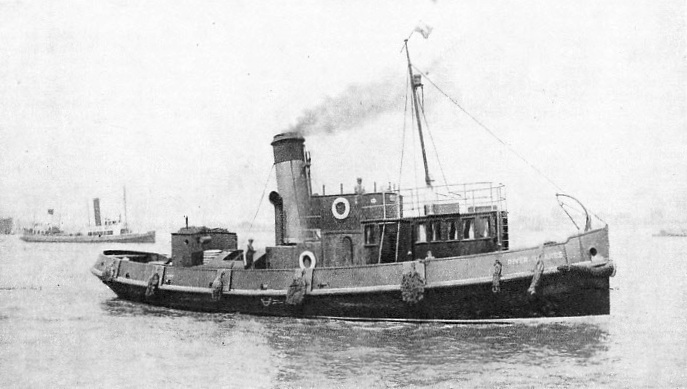 The cutters of the London service, stationed off the Sunk and off Dungeness, have the reputation for hanging on to their stations in practically any weather, when the cutters in other places would certainly consider themselves fully justified in making for port. Considering that all the pilots have to be transferred from the cutter to the ship by means of a small pulling boat, this is a fine boast, and it means a high standard of boat work. Occasionally, of course, weather conditions are too bad to maintain this tradition, but the occasions are so rare that they are talked of years afterwards. AT CALCUTTA. The big pilot cutter, Andrew. This twin-screw vessel has a gross tonnage of 1,241, was built in 1905 at Newcastle, and is owned by the Government of India. She has a length of 263 feet, a beam of 32 feet, and a depth of 18 feet. The cutters are remarkably fine vessels, and for the last forty years or so most of them have been steam-driven. Before then numbers of sailing cutters and schooners were employed, such as are still to be found in some districts. Some authorities prefer internal combustion engine-driven vessels to steamers. But whatever the type may be, seaworthiness is the first consideration. Many of the old pilot schooners and cutters, quite small vessels, have been eagerly acquired as yachts by sportsmen who want to sail in all weathers. The lines of the steamers, always kept as clean as men-of-war, are a careful combination of those of a trawler and tug, both types famous for their seaworthiness. Although, of course, it is impossible to be comfortable in such small vessels in a gale of wind, they are the admiration of every sailorman. READY FOR THE PILOT. The City of Singapore flying flags indicating her name and the port for which she is bound. 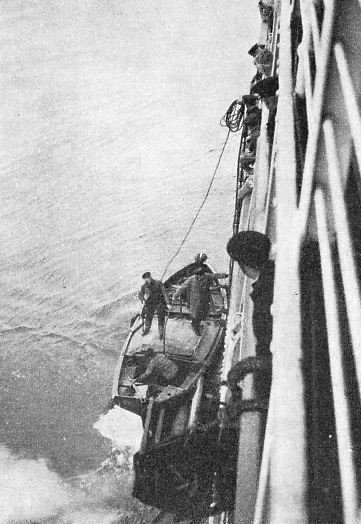 The ladder and boat rope can be seen hanging over her side ready for the pilot’s arrival. Every ship entering the great majority of British ports must, unless specifically exempt, take on board a pilot. 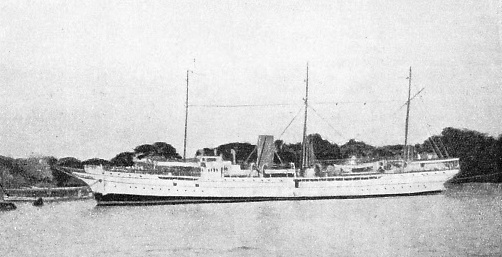 The City of Singapore, an Ellerman Lines steamer of 6,555 gross tons, was built at West Hartlepool in 1923. The vessel has a length of 433 feet, a beam of 57 feet, and a depth of 30 feet. Her port of registry is Liverpool. AT ROUEN. The pilot cutter photographed at this busy French port on the River Seine. Rouen is fifty-five miles from the coast by rail, and eighty-seven miles north-west of Paris. The name of the station appears in large letters on the pilot cutter. When the photograph was taken she was “dressed” in honour of the maiden voyage of the Normandie; normally she only carries the pilot flag. IN AUSTRALIA. A pilot cutter steaming along near Sydney, one of the world’s busiest harbours. Pilots are under strict discipline, and a minor error of judgment may entail suspension or dismissal by the authorities. The pilots on duty in the waiting cutter, on the London station at least, are all “on turn” and must take whatever ships come along in their order, unless there is a good reason for changing it. Such a change has to be approved by the senior pilot on board at the time. No choice pilot is allowed to select his ship from the cutter. He has to join any particular ship at a port of call - perhaps Middlebrough, Plymouth, Southampton or one of the French ports such as Cherbourg or Havre. Unless, therefore, the ship is to make such a call his choice position is of no value to him. The distance from the Dungeness Station to Gravesend is eighty-seven miles, which with an eight-knot speed means eleven hours; from the Sunk to Gravesend the distance is fifty-four miles, or at six and three-quarter hours at eight knots. For the whole of this time the pilot has to be on the bridge, keyed-up to the highest pitch of care, his only chance of a rest being if the ship is anchored for any reason. The reason is generally fog, which means little rest for any sailor who is afloat. By the time he reaches Gravesend, therefore, the pilot has had a trying time and is generally glad enough to hand over to the river pilot. The river pilot boards the ship at Gravesend and takes charge of her until she reaches her wharf or the entrance to the dock to which she is ordered. Formerly the river pilots were drawn largely from the tug masters, who had an unrivalled knowledge of the Thames, its dangers and currents, but latterly they have had to be certificated master mariners. Their spells of duty are shorter than those of the sea or Channel pilots, but there are more of them. Other pilotage districts - and there are over 120 of them in the British Isles - have routines designed to suit their circumstances. Some pilots - at Aberdeen, Sunderland, the Tyne and many other ports - cruise in their cutters about a mile off the entrance to the harbour, but in other instances it is necessary to go farther afield. For example, the Liverpool pilots cruise off Port Lynas and the Bar Lightship; the Newport and Cardiff pilots cruise in Barry Roads, the Clyde pilots off Greenock Pier. The conditions of service, fees drawn, and every other detail also vary with the district, and it is impossible to cover this extensive subject completely in a short space. Generally speaking, however, it is a matter of considerable pride that the pilots round the British Isles compare favourably with those of other countries. Under some flags pilots are no more than local fishermen, under some measure of control, possessed of good local knowledge, but rather incongruous on the bridge of a liner. At the other end of the scale may be found a naval pilotage service. There are also a number of special services such as the famous body of Hughli pilots, in Bengal, who have one of the most difficult tasks of all, on account of the constantly shifting bed of the river. They have to learn their craft by a long apprenticeship as assistant to the qualified pilots; but when they have done so and have been fully licenced, they belong to a service that is second to none in the world. is found necessary for them to await incoming craft farther out. You can read more on “Buoys and Beacons”, “Navigational Charts” and “Signalling at Sea” on this website.